The Nursery building has continued to make progress over the last two weeks. The electrical cables have now been run to the building as well as data for the eventual ICT. It is expected that the roof will start to go on at the end of the first week back! The children should be dressed in casual clothes with a waterproof jacket in case of rain. NO drinks to be bought with them as they will be confiscated at the entrance to the park. Lunch will be purchased for the children after the morning athletics session has finished - from McDonald's. Additional drinks and snacks will be purchased for the children as necessary. The children can bring spending money of up to £5 with them, but they are responsible for it. There is no guarantee we will be able to visit the shop due to the number of spectators in the park. We anticipate returning to Harold Wood station by 3pm. The athletics session we have tickets for is from 10am - 13.40pm. Once we have left the park, Mr Drakes will contact the school office and they will then inform parents of any changes to the time of arrival at Harold Wood station. This summer the Romford Recorder ran a competition for local youngsters. Through art the children would be able to show what the Olympic Games meant to them. Hundreds of school children submitted designs, with the very best going through to the final. Our very own David Sangojinmi (Year 6) was chosen for the final... where he won 2nd prize - a £30 voucher for the Liberty Centre. A weightlifter, diver and runner: these were just three of the Olympic athletes that he managed to include in his poster. Congratulations David, a great design and we are all very proud of you. The Olympics and Paralympics have brought us many stories of people overcoming incredible obstacles to achieve stunning feats. Here is one more that is a real testament to the human spirit and the belief that anyone can achieve anything! Amazingly an 11-year-old Brazilian boy has earned a place at the Barcelona football team's summer training camp - despite being born without feet. Gabriel Muniz was initially offered a place at the team's training academy in Saquarema, Rio de Janeiro, after appearing on a popular sports programme in Brazil. His story and skills inspired the club's managers and he was invited to the team's Spanish camp in September. How much do you know about the Paralympic Games? After such an exciting summer where Team GB pulled in an impressive haul of 29 golds, all the excitement is set to start again! However the Paralympic Games are a very different proposition to the Olympics. Did you know that it was only in 1988 that the Paralympics and Olympics were held in the same country? In addition the logo is completely different, not to mention the inclusion of some different sports: goal ball and boccia. What is exactly the same is the sense of unity through sport, the celebration of achievement over adversity and the quest for personal excellence. Read through the BBC's guide to the Paralympic Games so that you are fully up to speed with the programme for the weeks ahead! This survey is compiled by the London Borough of Havering, as part of the Harold Hill Ambitions Programme. They want to collect your views on Central Park, so that plans being compiled meet the needs of local residents. In addition to this survey there are a series of exhibitions planned. For more details visit www.havering.gov.uk and search for ‘Harold Hill Ambitions Community Programme’. During the holiday, we have had photos of the pupils used to decorate the entrance to the building and our library. Kittle Photographic did the shoot and produced the acrylic images for us, having been guided by Mrs Nicholls. The end results are - we believe - stunning! 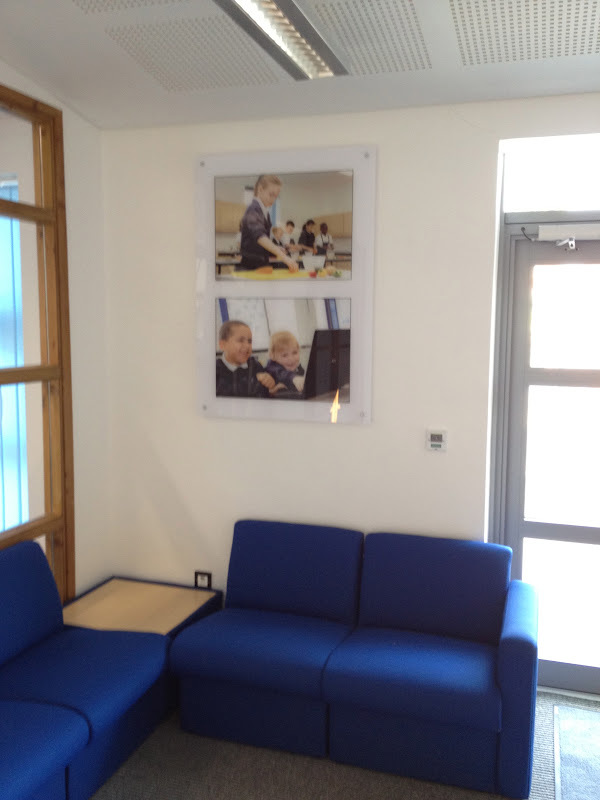 What better way to bring the school corridors to life than with images of our pupils. Showcased in the images are just some of the wide ranging activities that the children experience at Broadford: reading, ICT, gardening, PE and maths. Look out for them next time you visit us. David Sangojinmi's poster - which was inspired by the Olympic Games - has made it through to the final of the Romford Recorder's competition! With its bright colours, sporting images and imaginative use of London landmarks, it is easy to see why it was chosen to be shortlisted. Has he managed to win a prize? We'll find out soon! The winning entrants will win gift cards for the Liberty Centre in Romford. Congratulations David... and good luck. 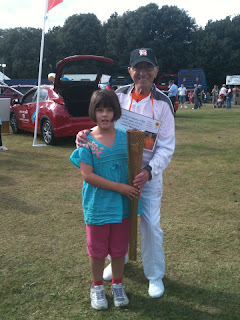 During the holidays, Jessica managed to have her photo taken (and hold) the Olympic Torch! 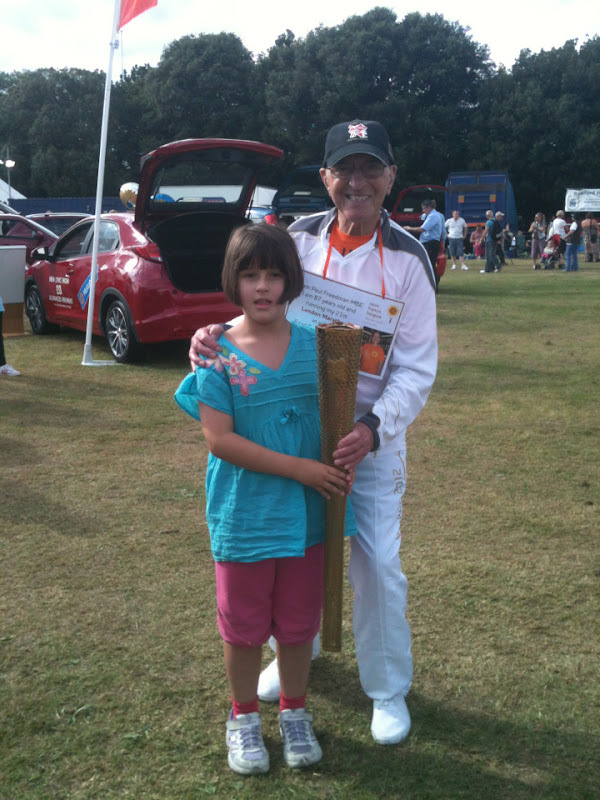 The Torchbearer she is with is a gentleman called Mr Paul Freedman MBE who at the age of 87 has just completed his 21st London Marathon. He has been raising money for St Francis Hospice, proving that sport is very much for all! The photograph was taken at the Havering Show today (Sunday) which was held in Harrow Lodge Park over the Bank Holiday weekend. After waiting months for the gardeners to plant the large flower bed outside Mr Drakes's office, a team of crack gardeners decided to just get the job done themselves. Armed with forks, trowels and rakes the green fingered workers made short work of the 9 metre square mud patch. With just a view lavender plants and some slate, the bed was transformed. Although what we don't want is lots of August rain to keep the ground moist... we'll have to do it by hand! While the children have been busy playing in the park, munching on ice creams and generally enjoying the summer break, the builders have been hard at work. Rising out of the ground is the new Nursery building. With the foundations in and brick work starting to fly up, it is really taking shape. At the top end is a new decked ramp that will provide easy access for Nursery parents. As a result of their outstanding attendance this year, ten children were drawn from the lucky bucket to attend an Olympic event. On Tuesday night the first four (Casey, Mark, Thomas and Myles) got taken to the Olympic football at Wembley stadium. Filled with hope of seeing a home win, the boys hurried excitedly to their seats. At least two of them had never been to a football match before. With an attendance reaching 70,584, in the national stadium, for an Olympic match, against Brazil, it doesn't get much bigger! Perched up on Level 5, the boys enjoyed a birds eye view of the pitch. When the England striker pounced mercilessly on a loose ball, the boys had a perfect place to see her thump it home... 1-0 Team GB. It was a great night out. We now have to wait until September when the remaining lucky winners will get to go and see some Paralympic Athletics.